In this detailed head to head review, I will be comparing the Benchmade Axis Flipper folding knife to the Boker Epicenter folding knife. As always, we will be using our categories to rank each knife out of ten marks. Before reading this whole review, you should check out both the Benchmade Axis Flipper and the Boker Epicenter on Amazon so that you are familiar with the knives that we are about to review. The Benchmade Knife Company manufactures knives for a loyal and ever growing following of knife users around the globe and their commitment to world-class quality is embodied in their well known motto: “It’s Not Just a Knife. It’s a Benchmade.“. One of their most popular models is the Benchmade Axis Flipper, which I am pleased to get hold of and review. Anyone who is familiar with Boeker (German spelling) knives is also undoubtedly familiar with their famous tree icon from which the “tree brand” name is drawn. This icon is more than just an artist’s fancy. In fact, this famous icon actually comes from a giant chestnut tree shading the small Boeker tool factory in Remscheid, Germany in the 17th century and it is the oldest traceable symbol connected with the Boeker name. Today, the Böker line of knives consists of the Tree Brand and Cinch Line of knives made in Solingen, Germany under the Tree Brand trademark, knives made in Buenos Aries, Argentina under the Arbolito trademark, and Boker USA which imports knives made in China and Taiwan under the Plus and Magnum trademarks. The Benchmade Axis Flipper was designed by Butch Ball measures 4 1/4″ closed and weighs 4.85 ounces. Also, it features a 3″, Clip Point, blade with a Saber Grind made from CPM 154CM stainless steel hardened to 58-61 Rockwell with either a serrated or a non-serrated edge and ambidextrous thumb studs. In addition, it features stainless steel liners and sand/earth G10 handle scales with satin barrel spacers, a Benchmade Axis locking mechanism, and a silver, reversible, tip up, deep pocket clip. 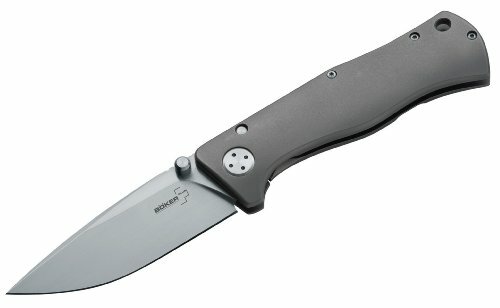 Last, the Benchmade Axis Flipper retails for $140.00. Whereas, the Böker Epicenter on the other hand, was designed by Todd Rexford and measures 4.81″ closed, weighs 6.5 ounces, and features a 3 1/2″, Drop Point, blade with a Flat Grind made from VG-10 stainless steel with a Rockwell Hardness of 58 and a non-serrated edge with a satin finish along with ambidextrous thumb studs. In addition, it features a titanium frame with a Frame Lock liner lock, a right hand, titanium, tip up/tip down pocket clip, and a lanyard hole for added convenience. Last, the Böker Epicenter retails for around $120. In looking at these two knives, I find that I like the Clip Point blade of the Axis Flipper better than I do the Drop Point blade of the Böker Epicenter. However, I like the titanium handle featured on the Böker Epicenter much better than I do the G10 handle scales with finger grooves featured on the Axis Flipper. In addition, I feel like the overall lines of the Böker Epicenter are much cleaner than those of the Axis Flipper. On the other hand, I am not particularly fond of Frame Locks but, I have to admit the Boker has done a better job of incorporating this type of locking mechanism into the Epicenter than any other knife I have seen so far. Consequently, my vote in this category goes to the Böker Epicenter. I am afraid that I fail to understand what possessed the designer of the Benchmade Axis Flipper to design this knife with such a short blade since it seems to me that a 3″ blade is better suited to a slipjoint pocket knife than it is to Lock Back folding knife. In fact, the Boker Tree Brand Large Stockman that I carry as my every-day-carry knife has three inch Clip Point blade and thus, if I were going to carry a Lockback, then I would want the blade to be at least 3 1/2″. The Böker Epicenter does have 3 1/2″ blade which suites me much better. In addition, please note the although the Benchmade Web site states that the Axis Flipper has a Drop Point blade, it is incorrect because this knife actually has a Clip Point blade. While I do understand the principal behind the “flipper” protrusion on the edge side of the blade on the Benchmade knife, I can't honestly say that I care for it in the least and in fact, it seems entirely redundant on a blade that has ambidextrous thumb studs. So, even though I tend to prefer Clip Point blades over Drop Point blades, in this case, I feel like the blade of the Axis Flipper is too short and the “flipper” protrusion tends to put me off. Therefore, I have a distinct preference for the blade design of the Böker Epicenter. CPM 154CM is an American-made, high-carbon, stainless steel made by Crucible Industries that contains 1.05% Carbon, 14.0% Chromium, 4.0% Molybdenum, and 0.5% Manganese and is a high-carbon, high-alloy, space-age, stainless steel that was first used for knives by R. W. Loveless about 1972. At that time it was vacuum melted but, after a few years, the quality declined because the manufacturer ceased to vacuum melt the steel and therefore, bladesmiths followed Bob Loveless to the Japanese equivalent steel ATS-34. However, 154CM is now made by Crucible Industries and thus, the quality has been restored. Consequently, its high carbon content makes it a very hard steel and its relatively high Chromium content makes it reasonably corrosion resistant. Also, it has an astronomically high Molybdenum content which combines with Chromium during forging to form, hard, double-carbide, bonds which increases the hardness, toughness, tensile strength, and abrasion resistance of the steel and its Manganese content also increases its tensile strength and abrasion resistance which makes the steel very tough. However, it lacks the key element of Vanadium which serves to refine the grain structure of the steel and thus, it cannot be honed to quite as fine an edge as blade steels that do contain Vanadium. VG-10 on the other hand is a Japanese-made blade steel that has a Carbon content of 1.0%, a Chromium content of 15.0%, a Molybdenum content of 1.0%, a Vanadium content of 0.2%, a Cobalt content of 1.5%. Also, VG-10 stands for V Gold 10 (“gold” meaning high quality), but is sometimes referred to V-Kin-10 (kin means “gold” in Japanese) because this steel is of such high quality that it is compared to a gold standard. Originally developed for use in high end Japanese Chef's knives, this steel is manufactured by Takefu Special Steel co., Ltd, based in Takefu, Fukui Prefecture, Japan (former cutlery/sword-making center of Echizen. But, this steel has recently gained great popularity for use in sport cutlery because it contains the four key elements of Carbon, Chromium, Molybdenum, and Vanadium which makes it a member of the new class of so called “super steels”. Also, it has a high Carbon content which enables it to hold an edge very well and a relatively high Chromium content which makes it highly corrosion resistant. In addition, the Molybdenum content combines with Chromium during forging to form, hard, double-carbide, bonds which increases the hardness, toughness, tensile strength, and abrasion resistance of the steel and the addition of Vanadium refines the grain structure so that this steel will take a significantly finer edge than steels that do not contain Vanadium. Therefore, as fond as I am of 154CM, it is noticeably lacking when compared with VG-10. Concerning the handle materials used on these two knives, it seems to me to come down to a matter of personal preference since I really don't see any significant advantage of titanium over G10. In fact, the only caveat that I can envision is that when the titanium handle of the Böker Epicenter is carried in winter, it might prove to be a little cold to the touch whereas the G10 would not. Also, it occurs to me that the G10 handle scales are noticeably lighter than the titanium frame of the Böker Epicenter but, other than that, I really see no advantage for on over the other except that G10 is obviously less expensive. Concerning locking mechanisms, the Axis locking mechanism is one of the most sophisticated locking mechanisms yet invented and it operates using a small, hardened, steel bar that rides forward and back in a slot machined into both steel liners. Thus, the bar extends to both sides of the knife, spans the liners, and is positioned over the rear of the blade when it is locked open where it engages a ramped tang on the blade. Also, two omega style springs (one on each liner) provide the locking bar with the needed inertia to engage the blade's tang and, as a result, the tang is wedged solidly between a sizable stop pin and the AXIS bar itself and is released by using the thumb to move the Axis bar to the rear. Whereas, the Frame Lock liner lock is similar to the Walker-style liner lock invented by Michael Walker for use on electrician's knives to lock the screwdriver blade in place. However, instead of using the liner of the knife to lock the blade in place, the Frame Lock is designed in such a way that a long groove is milled through the frame from the blade's pivot pin toward the pommel of the handle so that the top half of the handle rests tightly against the side of the blade's tang so that when the blade is opened, the top half of the frame moves in behind the blade's tang and locks in the open position. The Frame Lock is actually considerably stronger than the Liner Lock. Therefore, this type of locking mechanism makes opening and closing the blade with one hand a very easy task. Consequently, although I am not particularly fond of Frame Locks, I have to admit that Boker has done a better job of incorporating this style of lock into the Epicenter than any other knife I have seen so far. But, having said that, I also have to say that I find the Axis locking mechanism to be both far more sophisticated and aesthetically pleasing. * Due to fluctuations in the market, and special discounts – you should check the prices of both knives on Amazon to see the most up to date price. View the Benchmade Axis Flipper and the Boker Epicenter on Amazon to check the latest prices. When it comes to weighing the value of these two knives, I feel like the Böker Epicenter is a somewhat better value than the Benchmade Axis Flipper because of the titanium frame and the VG-10 stainless steel blade (both of which are very expensive) as opposed to a blade made from 154CM combined with G10 handle scales. 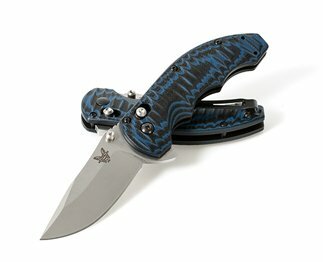 Consequently, I feel like Benchmade is relying on their reputation to justify the price of the Axis Flipper which I feel is somewhat over-priced. As I mentioned earlier, I find that each of these knives has aspects that I both like and don’t like. On the other hand, I also have to say that both knives are made by companies with a solid reputation for producing quality knives and indeed, each of these knives incorporates high quality materials. However, I have a distinct preference for the Böker Epicenter over the Benchmade Axis Flipper because I like its clean lines and higher quality materials better. Last, in adding up the numbers, I see that between these two knives the Boker is a clear winner on the Folding Knife HQ rating system, I have to admit that when I started this article, I really did not expect them to finish with such a wide point gap.